You may already know this, but there’s a monster of a project going on next to the First Niagara Center called HarborCenter. 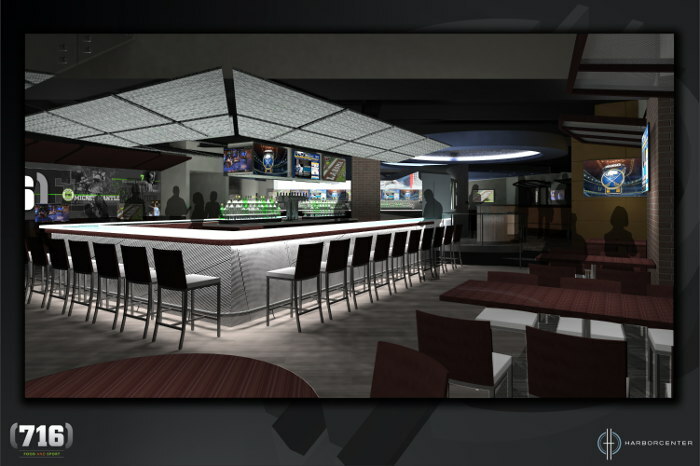 What you may not have heard is that part of the plan includes a brand new sports bar, dedicated to the best sports fans in the world, called (716) Food and Sport. Going by the numbers, the space itself will cover 2 floors and over 13,000 square feet. A 38 foot video screen will guarantee there’s not a bad seat in the house. 55 additional big screen HDTVs will be spread throughout the room, as well as televisions embedded in the bathroom mirrors. 2 island bars and a 40 foot main bar will have custom bar tops replicating the ice on an ice rink, complete with illumination and skate marks. 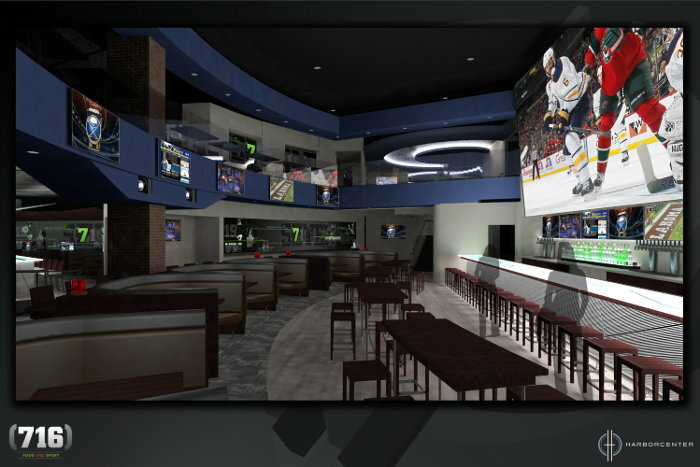 8 personalized booths with dedicated TVs and sound, a special VIP area, and a seating capacity of over 500 will make it the most exciting sports watching venue in Western New York. In an effort to have all the entities of HarborCenter working together, (716) Food and Sport will also be handling the concessions for the ice rinks and have a direct relationship with Impact Sports Performance, the cutting-edge training facility located on the sixth floor. 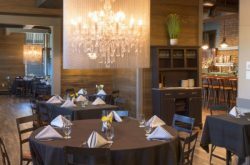 We wanted to know a little more about this little known project, so with the help of HarborCenter’s Communications Manager Don Heins, we sat down with the (716) Food and Sport Team: General Manager Dominic Verni, Assistant GM Ron Kubiak, Service and Beverage Manager Craig Altobello, and newly named Executive Chef Andrew Nuernberger. And even though they weren’t willing to discuss the prospect of a certain NHL owner becoming the future owner of our favorite NFL team, they were more than happy to talk about anything else. So, when will (716) open? Will it coincide with the opening of HarborCenter? Don Heins: We’ve been on track for a fall opening. So, we’re looking at late October right now. The plan is to bring it on line the same general time as the rinks. We noticed that the management team has experience with the Hard Rock Café. What do you think you can bring from your experience at Hard Rock to (716)? Dominic Verni: Well, with (716) Food and Sport it’s going to be about the experience, and with our past lives, experience has been high on the priority list. It’s going to translate into sports and bringing Western New Yorkers and visitors alike the best food and sport experience we can. Ron Kubiak: I would agree. Just like everybody has their own favorite rock band or any kind of band, everybody has their own favorite sports team. I think people will come in and have an unbelievable time, not only from the food and drink, but the atmosphere as well. 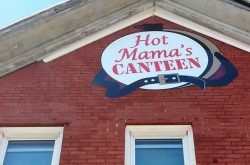 Craig Altobello: Both venues have an emphasis on food, drink, and atmosphere. 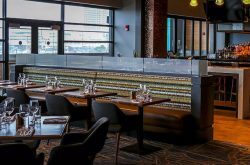 At Hard Rock we dealt with a premium atmosphere, and (716) will have premium atmosphere. We’ll be shocking everybody by what we can provide. Chef Andrew, how does it feel to be the newest member of the team? Andrew Nuernberger: I’m just really excited to be here, to be a part of the experience and to work with the team that brought me into work with all the ideas and talent we have in house to really build a menu. We’d like to hear about that menu. Will it be all Buffalo Wings and Beef on Weck, or are you planning a few surprises? Nuernberger: We have a lot of surprises. I just got on board, and the ideas and concepts are very exciting. 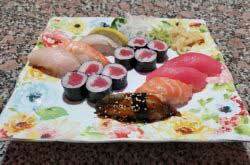 It’s an all scratch kitchen, coming up with creative ways of presenting the food. We’re also going to be touching on a lot of high end entrée choices, as well as sourcing out local food, using local vendors. Can you give any specific examples? Nuernberger: We have a line of pizzas we’ll be doing from scratch in house. We’re working on our own dough recipes, getting pepperoni from Battistoni Meats; we’ll be doing a Beef on Weck sandwich and incorporating a fancy cheese in there; we’re also going to be looking into doing some high-end fish entrees, some pasta dishes, working on a couple of steak plates with our own sauces that are made in house, things of that nature. Kubiak: We’re also working on a section of the menu where we’ll feature some excellent lower calorie, under 716 calorie dishes. Verni: Yeah, the emphasis at HarborCenter is sports and sports performance and really developing that peak athlete, so to have some items that coexist with Impact Sports Performance will be a great option for the athletes that come visit us. You mentioned Battistoni Meats. What other local products will you be working with? Nuernberger: (716) is our code, so we’re sourcing out Rich’s food products, Weber’s Horseradish and mustard. Putting that nice local flair on it, and keeping it in house from scratch. Kubiak: You can also look for Sahlen’s, Mineo and Sapio, General Mills, Cheerios and Wheaties. We’re breading onion rings in Wheaties crumb. Verni: And we’re not going to just use them as ingredients, but highlight them. Kubiak: And tag them on the menu. Verni: Definitely. We’re going to highlight our partners versus just putting them on the sandwich. And since Buffalo is a beer town, how will local breweries fit into (716)? Altobello: Under the (716) code we’re looking to have as many local breweries on tap as possible. So far we’re slated to have Community Beer Works, the Hamburg, Ellicottville and Southern Tier Brewing companies, and obviously Flying Bison on tap. We’ll also have McKenzie’s Hard Cider, and we’ll keep expanding as Buffalo expands. So Buffalo is the inspiration behind the menu? Kubiak: We wanted to do Buffalo with a twist, as well as provide an experience with the food. Something you wouldn’t expect when you went to a sports bar. 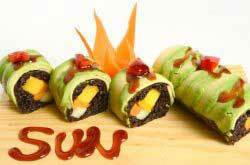 We want to blow people away with not only the service, but also the food. (716) is being promoted as the ultimate fan experience, can you tell us a little bit about what that experience will be like? Verni: It starts first and foremost with the 38 foot screen. That in itself is going to be a game changer in how we view sporting events. That, and all of the different events we plan on putting on from your Super Bowl Parties, to Wimbledon and Kentucky Derby Parties. It’s going to be a combination of the facility along with the food, the great atmosphere, and the events we put on. Altobello: And to touch base on that a little bit, when we do have these events, my cocktail list is going to change according to the events. I want to do a really nice Mint Julep during the Kentucky Derby, or offer a Pimm’s Cup during Wimbledon. And just immerse people in the event. Verni: The game plan is to hit everything that’s sports. All of these events are going to be non-typical. When you throw your Super Bowl Party, yeah a lot of places have Super Bowl parties, but we’re going to incorporate something special within them. We’re going to make it the biggest Super Bowl party around. I think the size and scope, and the effort we put towards the event is going to be the big differentiator. This is going to be the new home for the big sports fans and sports lovers. 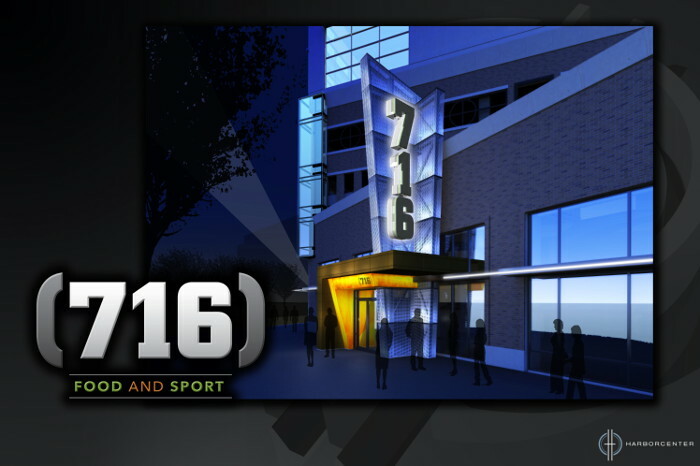 What else do you think will set (716) apart from a typical Sports Bar? Verni: The great food, the great experience. At the end of the day it’s about delivering those items better than anyone else. You know, doing those things with an excitement, doing that with the embracing of Canalside, and embracing the community. I think what will set us apart is the love and the passion for sports and the restaurant. Kubiak: The total experience is what we’re after. The sports enthusiast, the foodie, somebody who’s into craft beer. And covering all bases and ensuring we hit all customer touch points when they come through the doors. Verni: It’s going to be a first class experience, no question. And you feel that embracing the community is important to (716)? Verni: On the priority list, it’s right at the top. This is about the area, this is about the district, it’s about downtown Buffalo. That’s the reason we picked (716) as the name, because it embraced all of that.